Visual storytelling has the power to communicate with clarity and impact, and in doing so to engage and persuade audiences. That’s because great stories help sell great ideas. The business world realizes this, but visual storytelling doesn’t exist exclusively to sell products and services, or to grow market share or reduce cost. Visual stories also serve populations in need, especially through organizations looking to influence public opinion and/or policy in the context of political, economic, and social systems and institutions. This is called advocacy, and visual storytelling is especially helpful in enabling social change organizations like non-profits and NGOs to connect with their audiences, to show them they share the same values, to turn information into insights, and to motivate people to take action to help solve a problem. This infographic, created for a public health organization’s annual report, is one of many visual storytelling examples we created for NACCHO that help its constituents understand and appreciate the group’s current state through data. Many advocacy organizations work on urgent issues—issues that often are a matter of life and death or otherwise have some critical impact on the peoples’ lives. This includes health, education, the environment, safety, and justice, to name just a few. And these groups may operate at the local, national, or international level. So how can advocacy benefit from using visual stories? Whatever the size and wherever they’re located, you can count on the fact that advocacy organizations do two things: they’re out there helping people, and they’re collecting and sharing information. They generally have the “helping people” part down. And the “collecting information” part. Where we often see them tripping up a little is in the “sharing information” part. It’s not that they don’t or won’t or can’t—they do! It’s just that this information is frequently sent out as dense written reports. These detailed papers are extremely important and are a necessary part of the advocacy world (and sure, there are usually pie charts sprinkled here and there) but they don’t exactly make a point with the emphasis and urgency that’s needed. Many advocacy groups have found that they can better engage key audiences—media, funders, government officials, the public, even internal stakeholders—by summarizing key ideas, needs, and goals in visual stories. By using information design, animated videos, presentations, and illustration to explain complex scenarios to various audiences, groups working for social change can help make sense of the busy, resource-strapped, and sometimes dangerous world they operate in to the people that can help. This poster for Data Quality Campaign explains who uses different types of student data. One way this can happen is by turning ordinary information into engaging data visualizations. As we’ve said before, data viz is powerful: it can both break down data and highlight connections. It can show trends and progress; it can show contrast and causality. Data visualizations, combined with visual storytelling, can bring to life the extent and depth of complex data as well as bubble up key findings in simple, powerful ways that make that data more accessible, understandable and usable for a variety of non-expert audiences. All of this helps to engage and empower people in understanding, defending, and promoting a common cause. Data is key, but so is the human aspect. Numbers and statistics are only part of the story when we’re talking about things as varied and important as nutrition, mental health, education, disease, diversity, gun safety, or climate change. This is where the power of storytelling shines. If you want to increase engagement and empower people to take action, you’ll have to make them care. In today’s world it’s not easy to stand out from the crowd. All of us are hit from every direction, every day, with messages imploring us to care about this, to buy that, to do this, and to think that. Visual storytelling is a powerful way to cut through the noise and drive awareness. All good advice. But the fact is that advocacy groups have historically relied on heart-rending copy and soul-stirring photography to carry the emotional weight of their stories. Obviously this can be powerful, but you have to admit it does not always stand out in today’s chaotic world, where news cycles and attention spans are measured in mere seconds. Many people have become inured to stories of need and desperation but custom visuals can help give your unique message a boost, ensuring it’s conveyed with clarity, detail, and impact. This infographic, also produced as an animated video, helps the Center for Vulnerable Populations at UCSF explain the dangers of too much added sugars in young peoples’ diets. Business storytelling and storytelling marketing have long been effective in the corporate realm, especially in this era of digital storytelling. Cause-focused groups can leverage the same elements of storytelling used sell software, pharmaceuticals, and cars to support things like domestic violence education, local parks, women in tech, and mental health. In fact, we’ve got some visual storytelling examples right here. Let’s take a look at how Tremendousness partners with clients to use visual stories to promote a variety of different causes. This infographic for Future of Privacy Forum highlights potential privacy issues as cities get more and more technological. It was also produced as an interactive website. A few years ago we teamed up with Big Mountain Data and Salesforce to share new insights into the impact of domestic violence on women, including why many stay in abusive relationships and why they ultimately leave. Why is this visual storytelling example so powerful? 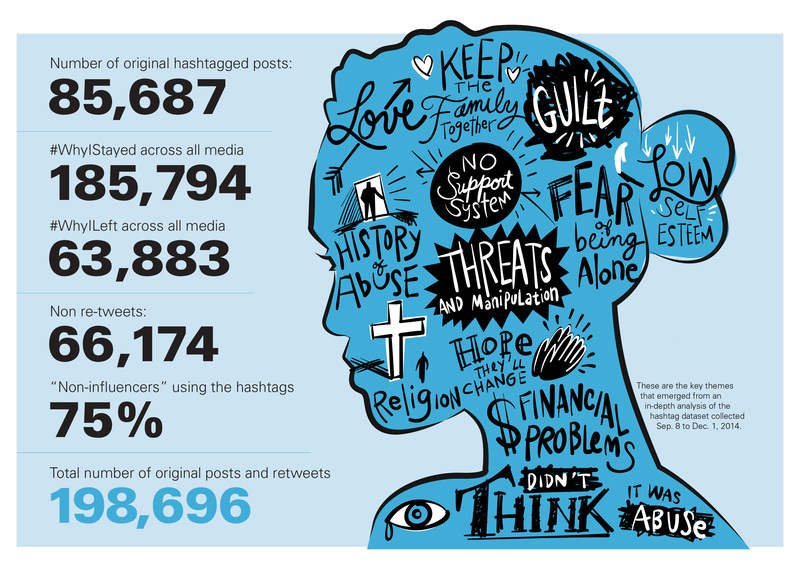 It not only highlights some staggering numbers on the topic—both in terms of the issue and in terms of hashtags trends—it also tells women’s stories in their own words. Arlington Public Schools is fast-growing public school county in Arlington County, Virginia. This rapid and continued growth requires rigorous planning and development by APS leadership to ensure all students continue to be provided with the best possible learning experience. In order to help people align around the vision and highlight how key initiatives map back to the broader strategic plan, we worked with the APS leadership team and the school board to refine an already existing 3-5 Year Action Plan and created a carefully categorized swim-lane style one-pager that effectively presents APS’s goals. We worked with St. Louis’ Forest Park Forever to design an information-filled graphic to compel supporters to donate or to become a full member. Because of our love for (and proximity to—we’re just a block away) Forest Park, we didn’t want to address this in a typical “by-the-numbers” infographic approach. The result is a poster that a fan of the park would want to hang in their home or office—one that feels more like a celebration than a promotion. A series of short animated videos that FPF uses on social media help to bring in new supporters. The idea of practicing gratitude can be a fluffy topic, but it’s finally leaving the yoga mat and entering the mainstream. Here at Tremendousness we thought it was important to help add to that momentum. Part of what’s stoking gratitude’s recent popularity is the amount of research that’s going into it—and the positive proof that’s coming out. We worked hard to figure out how abstract visual concepts and metaphors could help create a calm, clear, fun, and meaningful narrative around the science of gratitude and how to incorporate it into your daily life. Tremendousness is a visual storytelling agency that uses visual thinking, information design, illustration, and storytelling to help businesses, nonprofits, and other organizations explore and explain complex ideas, innovations, products, and processes. Team up with Tremendousness today to enjoy the many benefits of visual storytelling in your advocacy projects.